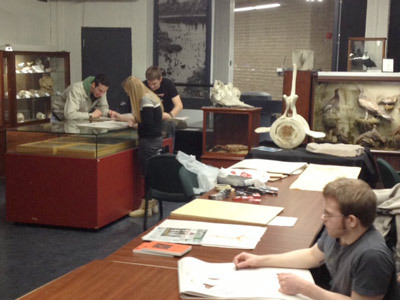 The first Observation Drawing session was held in the McCulloch Museum on March 12th. Thanks for the interest of the the several students who attended. The museum turned out to be a very good location for this type of session – with lots of variation in subject (Audubon birds, skeletons, coral, bugs, fossils and more), scale (bugs to whale bones) and with excellent space across the room. Lighting in the cases is very good, and supplemental lights in the next session will provide opportunity to increase contrast/shadows. The bird case displays have some interesting history. The McCulloch collection was established in the early-1800s, as educational material for the Pictou Academy (1816-1837). While at the Academy, McCulloch instructed the teenaged, Sir William Dawson, the namesake of the Dalhousie Geology Student Society, former President of McGill University, and famous Carboniferous paleontologist and friend of Sir Charles Lylle. Thomas McCulloch was also the first Principle of Dalhousie University (then Dalhousie College). McCulloch’s bird collection was inspected by Audobon sometime around 1836, and Audubon apparently provided McCulloch a print as gratitude for meeting and discussion of ornithology. The McCulloch Museum was founded in 1884 when McCulloch’s brother donated the ornithology collection to Dalhousie University. The Observation Drawing sessions will continue through March.